The following is a guest post by Luque Wang, a senior marketing manager of global strategy and operations at GE Digital. Ten years ago, marketing operations was still a very new role in org structures. The number of people with marketing operations as their job title were few and far between. Today, marketing operations has become the backbone of a marketing team driving the marketing excellence and supporting the business growth. But what is marketing operations? Marketing operations empowers marketing to efficiently scale with quality and consistency. Imagine an organization as a country, marketing operations is like the roads and bridges that connect its cities, plants, people and resources within the country, and transport all sorts of assets inside and outside the country. For an organization, marketing operations conveys all sorts of data across various channels with the governance to provide business insight, and join not only marketing programs but also different departments and business units as well as external agencies together to accelerate sales and support business expansion. With the rise of martech, marketing operations has been steadily redefined, as have marketing org structures. Now marketing can do a lot more than it was able to before, and has changed its character from mostly art to a greater combination of art and science. Although in many companies, marketing may be still rooted in its traditional functions, which are typically led by creative design and marketing communications, that old model is being rapidly modified by many startups and global enterprises alike. Under this new model, driven by martech, marketing operations has expended its responsibilities, adding new elements such as analytics and tech management, and consolidating many functions that were used to be stand alone, such as brand awareness, and lead gen, into one integrated function. Together with martech-enabled marketing operations, product marketing, event marketing, customer marketing, partner marketing, and market research outline the new landscape of marketing. With this change, martech-enabled marketing operations doesn’t only manage end-to-end native marketing activities, but also aligns with product development and sales to support product launches and drive pipeline growth. It creates marketing excellence by matching marketing strategies with metrics, holding accountability with data-driven decisions, and enabling ROI review with real-time analytics and trending reports. This is self-assessment and goal setting, basically, to understand what you have and what you want. What are your marketing strengths and where are the gaps? What are the steps you need to go through to achieve the desired business goals? It starts with defining your go-to-market strategies and the tactics to implement and measure each strategy, including budget management, and asset management. What is the list of tools we have versus we use? Do we have too many tools or too few? How do we want these tools to work together to provide a holistic view of business rather than siloed reporting? Increase your branding awareness as a thought leader in your market by creating a content machine that supports a broad content distribution strategy. It includes developing a content calendar and creating collaterals, such as web pages, blogs, white paper, videos, infographics, brochures, and ads. You’ll need to decide how you want to leverage each channel to distribute your content: organic vs. paid, self-developed vs. sponsored, and social media vs. public relations (PR) as well as analyst relations (AR). Based on your strategic planning, you also want to decide how resource and budget should be allocated to digital marketing vs. traditional marketing. Establish marketing lead gen and lead nurturing programs that capture early-stage leads and qualify them through the marketing-sales funnel. Customer intelligence is the key here. Half of your battle in this arena is determined by the maturity of your marketing automation ecosystem. What tools do you use, and how does each tool integrate with each other? Is your marketing tech stack talking to your sales tech stack? What’s the complexity and implication if you add a new tool or remove one? Can you truly automate the process that you don’t want to manually maintain? Last but not the least, how competent is your marketing automation team? Remember, almost 11 times more companies are using marketing automation today than were in 2011. Yet, 27% of companies say that their marketing automation maturity level is still “new,” and 64% of enterprise marketing operations teams have ten or fewer members. Creating a repeatable marketing offering that enables your sales team to quickly land new customers and demonstrate value. You can develop sales playbooks, compile competitive analysis, and design email template. You can also provide training to sales regularly to help them better understand the customer intelligence and market insight you captured. But more importantly, you want to setup standard operational procedures (SOPs) across marketing and sales. These SOPs help the marketing team provide business insight in a consistent manner, guide the inside sales to connect marketing initiatives with sales activities, and ensure the field sales to input clean data into the CRM to form a single source of truth. The effectiveness of marketing operations can be and should be measured, and setting up such metrics helps to foster a metrics-driven culture in an organization. This is another example where martech-enabled marketing operations goes beyond the traditional marketing scope. It aligns with sales to create a SMarketing model, where marketing and sales have integrated goals and approaches, agree on common terminologies and KPIs, and have measurable targets and mutual accountabilities through the entire marketing and sales process. Depending on the time sensitivity, measurement can be grouped into real-time analytics and notifications and trending reports. Depending on the business, metrics can be grouped as content-based, contact-based, and traffic-based. To read more, please refer to 10 Metrics that Help You Gain More Insight into Your Marketing Operations. The maturity of the marketing operations goes along with the evolution of martech. Five years ago, there were less than 400 MarTech vendors available in the market. Today, this number has reached over 5,000 by 2017 and is still growing, according to this blog’s marketing technology landscape. Marketing operations should take the ownership and leadership of martech tools, rather than leaving them with IT. Marketing operations should regularly review and optimize integrations between each tool within the martech ecosystem, strategically balance and validate marketing automation versus genuine personalization, and diligently evaluate and push technological innovation within the organization. 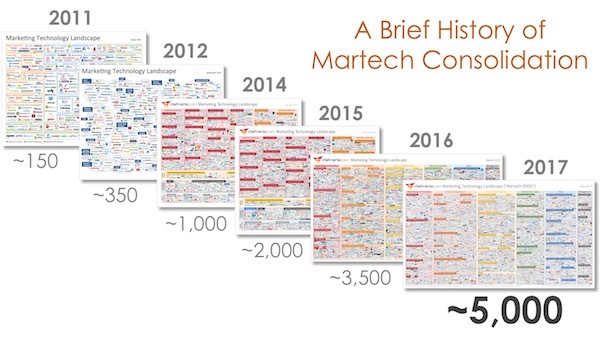 As martech continues to expand and evolve, it becomes more and more demanding for martech-enabled marketing operations professionals to expand their knowledge and experience beyond classic marketing, such as branding or PR, into analytics, IT, sales, finance, and other cross-functional roles that are not traditionally considered as marketing. Develop integrated SMarketing operations to align marketing and sales. A typical way is to design your closed-loop funnel and set the goal of each layer from bottom to top. Starting at the bottom of the funnel, the target annual sales, you estimate the number of closed deals needed, and the number of opportunities in the pipeline based on the closing ratio. Then in the middle of the funnel, calculate how many sales qualified contacts (SQCs) are required to fill the pipeline, and how many marketing qualified contacts (MQCs) are required to generate these sales-ready leads. Martech-enabled marketing operations can also enable agile marketing by coupling people from cross-functional teams. For example, pair a strategist with an IT expert for a given project. The strategist needs to have business sense with some technical background to effectively convey business requirement and validate the implementation, whereas the IT expert needs to have the deep technical domain expertise to fulfill strategies. 20 years ago, when a solicit ad was sent out, the best a marketer could do is to hope the phone rings. Today, when a business deal is closed, we should be able to tell when and who from the buyer’s side made the first search on our website and filled out the first web form, regardless it was two days ago or two years ago. Thanks to martech-enabled marketing operations, we can track and analyze every step of a customer along with his buying journey. It’s true for B2C, where emotion plays a significant role, and equally true for B2B, where decision makers usually only surface in the later stages during a long sales cycle. A metrics-driven culture enables us to easily get the answers to many strategic questions. For example, which source provides the most qualified contacts? What is the percentage of marketing leads to the contribution of pipeline growth? Which sales person performs the best this month and which one would miss the target? Which sales stage has the slowest sales velocity that needs to be fixed? We can adjust our marketing strategies based on content conversion and allocate budget to the most effective channels. Metrics-driven culture backs up our decisions, encourages us to focus on results yet not to be afraid of risk, and holds everyone accountable for each business activity.